I typically try to avoid books that are divided between two time periods, but that’s getting harder to do! Uncovering the past is a current obsession in literature. The time period of this book was similar to Kate Morton’s The Secret Keeper, but the plot was not as full and well developed. 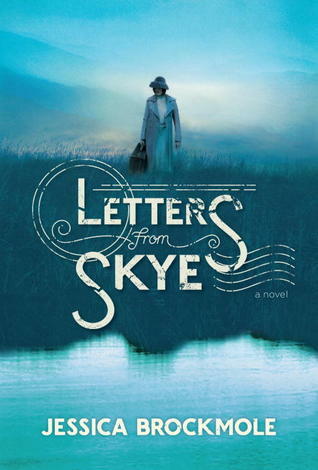 Over all, Letters from Skye was middling to not all that great. I loved the setting of the Island of Skye, off of the coast of Scotland, but more description would have really enriched the book. The characters didn’t appeal to me much. The main character, Elspeth, is intriguing and likable at first. She has an Emily Bronte vibe to her. Her choices throughout the book baffled me, though. Her daughter Margaret is more of a Nancy Drew. She sometimes made me think “give me a break with the gumption thing, will you?” The male main character, David, is…erm…not my type. If you have read this book already, you know what I mean when I say, “Team Iain!” For the most part, I wished the characters of the first World War would just get out of their own tangled way. But beyond the characters, the part about this book that brought it down most for me was the theme of adultery. I know, I know, how Puritan is it to throw out the scarlet letter and hate on it. But this book makes an extramarital affair look mostly lovely, which seems convoluted to me. I know life isn’t black and white, I know the human mind can justify all kinds of things, but in the lives of some of my friends currently and since high school, I have only seen the ugly truth that extramarital affairs cause wreckage. Have I seen good come out of these situations? Yes, sometimes, but the good is slow to come and comes with a great deal of pain. Though this book doesn’t completely ignore the heartache of an affair, it does skim over it way more than reality does. If you enjoy books made up of letters exchanged between characters, I’d recommend The Guernsey Literary and Potato Peel Pie Society or 84, Charing Cross Road over Letters from Skye.